Gathering metadata: humans or machines? Artificial intelligence (AI) is a field that is becoming more and more important in our lives. Whether it concerns speech recognition on our smartphones or autonomous driving and parking systems – the technologies are varied and they keep on evolving. In order to do that, however, data labeling is vital. Systems need to understand what is shown on a photograph, said in a voice recording, or written in a text, among many other things. By labeling all this data, machines can improve their learning and AI keeps evolving. Artificial intelligence has come a long way since the first developments in the field. Today, software can perform tasks that were unthinkable just a few decades ago. But the quality of AI still depends on human input that helps the systems learn. The algorithms can only function properly if there is some sort of human interaction. By learning from people, the machines can develop ways of providing human-like results. This is why it is so important to provide data labeling to software developers. Every bit of data gives the system a better understanding of how we see, hear, or define things. The quality of data that is achieved through human input is greatly superior to what a machine would be able to develop on its own. clickworker offers a lot of data labeling services / image annotation services around training of artificial intelligence systems! How can data labeling be achieved in a quick and efficient manner that still allows the people involved to enjoy what they are doing? At clickworker, we offer lots of microjobs that can be taken up by the thousands of Clickworkers around the world. Any Clickworker can choose which tasks to work on and thus find the jobs that interest them the most or work on a variety of different tasks. This keeps the work interesting and exciting. There are, of course, some specifications regarding who can perform each of the microjobs. Some of them only require the Clickworker to speak a particular native language or come from a specific region. In some cases, however, a more detailed know-how of the individual field is necessary. With every task, we create a profile based on what is needed by the customer and offer the jobs to all Clickworkers that fit this profile. 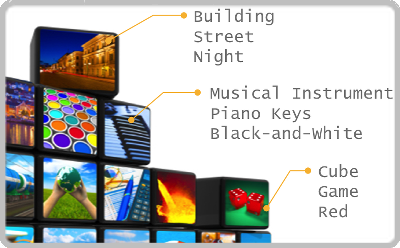 Data labeling service comprises many different tasks. This includes, for example, putting electronic markings on image files (e.g. 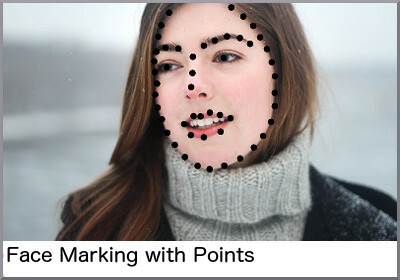 bounding boxes), placing marks on significant areas on pictures of faces, tagging pictures with relevant keywords, or rewording texts with regard to the word order or the chosen person perspective. Another important facet of data labeling service is categorizing texts, audio files, or videos according to their content. This so-called sentiment analysis lets your system know what customers feel and mean when they are getting in touch with you. As mentioned above, putting markings on images is an important part in data labeling service. This can take different forms. 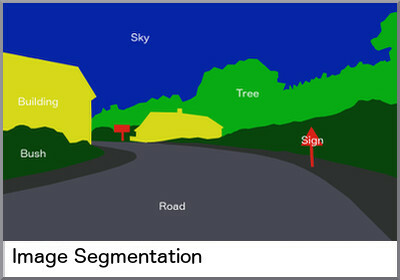 Bounding boxes, for example, are used to mark recurring elements in one image, such as multiple vehicles (see image). 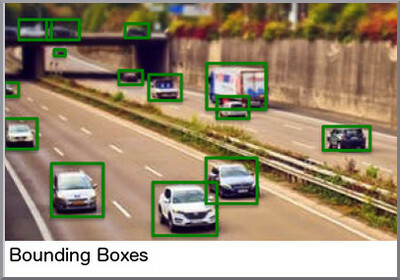 This allows the algorithm to recognize different shapes in various positions and sizes as belonging to the same category (vehicle). 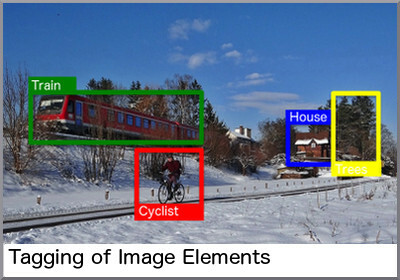 It is also possible to tag the elements and thus teach AI what is shown in each image. If the goal is to classify different parts of an image, segmentation can be useful. In this case, labels are applied to every part of the image. Every part that has the same label is then represented in the same way which makes it easier to be analyzed. To improve facial recognition software, face markings can be used. Points are placed to indicate the shape of the face, the lips, eyebrows, and more. By learning from these markings, algorithms can more easily identify faces, even if they are shown from different perspectives or if the entire face is not visible. Understanding text can be difficult for AI. Natural language is unlike constructed or formal language and can therefore not easily be parsed by machines. People use repetitions, idioms, or tropes such as irony, often without conscious planning. It takes human understanding of this language to allow machines to learn from it. One way to achieve this is text mining or text analysis: During this process, natural language is structured to help AI work out the meaning. Would you like to find out more about our data labeling service? Contact our sales team and let us know what you need in order to improve your algorithm. We have great solutions for you to help you improve your AI.